We compared preoperative regular activity and low-activity radiology-based predictions with real surgical and pathological findings for parathyroidectomy surgery. The study retrospectively analyzed 54 consecutive cases (2009–2016) for benign tumor removal. 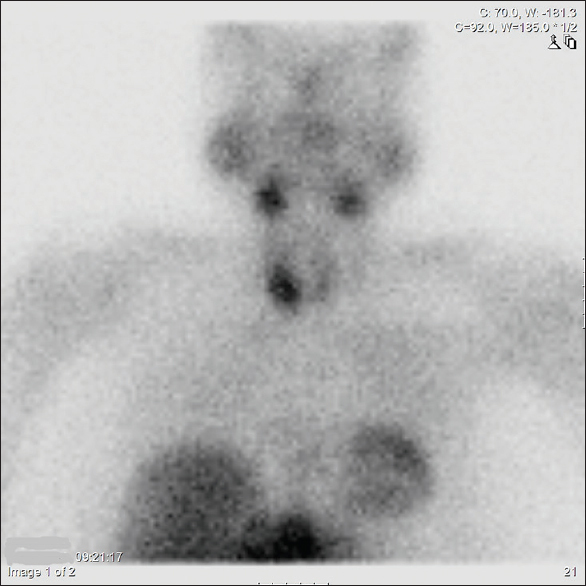 Technetium-99m (Tc-99m)-sestamibi was used as a diagnostic radiopharmaceutical for diagnostic dual-phase parathyroid scintigraphy and single-photon emission computed tomography/computed tomography. We assessed images obtained with the radiation activity of 925 megabecquerel (MBq) and images obtained with the activity of 185 MBq. The study compared preoperative evaluation of tumor presence, multiplicity, location, and the type of pathology with actual data that were revealed during the operation and pathological investigation. The agreement between preoperative radiological prediction and actual location, number, and type of the parathyroid lesions was achieved in 98.4% (n = 61/62 lesions). The agreement between 925 MBq-based and 185-MBq based investigations was 100%. The agreement between radiological and pathological findings was 100% for both investigations. Our data suggest that the radioactivity of 185 MBq applied in the evaluation of the parathyroid glands provides results similar to the currently used 925–1110 MBq if used for diagnostic dual-phase parathyroid scintigraphy with Tc-99m-sestamibi. Such radioactivity may reduce the exposure to radiation of the patients and the staff without compromising results of the investigation. The number of the parathyroid glands varies in normal individuals from 1 to 12. Variations of location of the glands are also numerous and can lead to difficulties during surgical exploration of the neck in cases of thyroidectomy and parathyroidectomy., Parathyroidectomy is needed for patients with primary hyperparathyroidism that emerged because of solitary parathyroid adenoma, parathyroid hyperplasia, and parathyroid carcinoma. The only treatment for primary hyperparathyroidism is parathyroidectomy of the affected glands. In the past, this procedure included bilateral neck exploration which was associated with not only a high success rate (94%–98%) but also with high risk of injury to the recurrent and superior laryngeal nerves. The small size of the organs (from 2 mm × 2 mm × 0.5 mm to 7 mm × 4 mm × 2 mm) and variability in their location forced practitioners to reinforce computed tomography (CT) investigation with single-photon emission CT (SPECT) and with positron emission tomography. The use of these and another preoperative imaging techniques (scintigraphy, ultrasonography, four-dimensional CT, and magnetic resonance imaging) and radio-guided procedures depicting the affected gland were adopted as the standard of care, resulting in minimally invasive procedure. 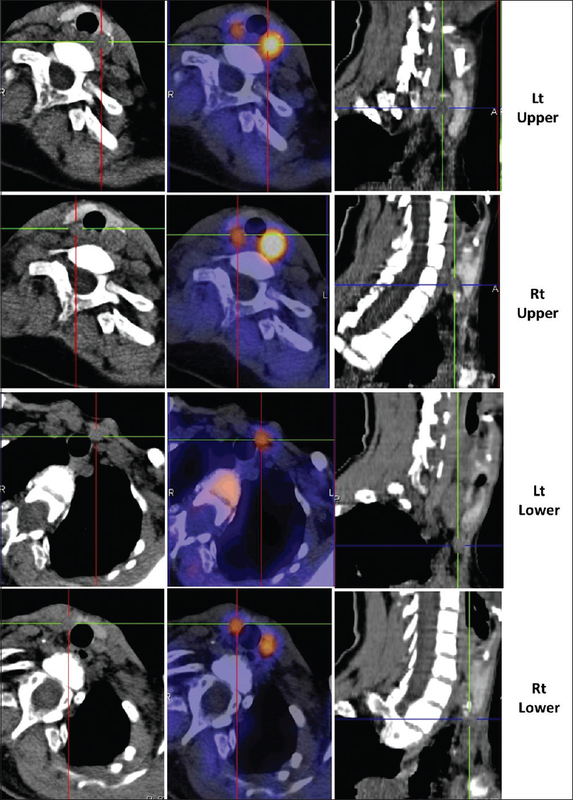 The addition of SPECT and SPECT/CT to radionuclide scintigraphy was found to increase the sensitivity and accuracy of locating the abnormal glands., The CT component provides attenuation correction for the SPECT data, accurately localizing the sites of tracer activity, and improving the success of a minimally invasive surgery. We hypothesized that activity lower than 925–1110 MBq may provide the same results if implemented in the hybrid SPECT/CT system. The aim of this study was to evaluate the sensitivity of low activity (185 MBq) of Tc-99m-sestamibi planar scintigraphy and SPECT/CT, using Symbia hybrid camera, for localization of parathyroid adenoma, as a preoperative diagnostic tool. In a retrospective study, we investigated 54 consecutive patients (M: 21, F: 33, median age: 55.9 ± 13.4) who underwent parathyroidectomy because of primary hyperparathyroidism. The study protocol conformed to the ethical guidelines of the 1975 Declaration of Helsinki (amended 2013) as reflected a priori after approval by the Helsinki Committee of our Medical Center. The patients' informed consent was obtained in all cases. In all cases selected for the analysis, the patients underwent two parathyroid scans. The following protocol was implemented for both scans. The early-phase planar scintigraphy was performed as usual after 10–15 min since 925 MBq of Tc-99m-sestamibi was injected (effective radiation dose: 8.325 mSv). Two images were obtained: the first was with Zoom ×3 concentrated on the thyroid gland and the second was with Zoom ×1.5 for the thorax to rule out ectopic adenomas. After 60 min since the injection, the SPECT/CT image with Zoom ×2 was obtained. After 120 min, the regular protocol delayed phase planar scintigraphy images were obtained again with Zoom ×3 and ×1.5. The second low-activity scan was carried out preoperatively, on the operation day, by the same protocol but using only 185 MBq of Tc-99m-sestamibi (effective radiation dose: 1.665 mSv), to ease intraoperative adenoma location with the aid of a gamma probe. The average period between these two scans was 58 days (range: 30–73 days) that permitted the patients being completely radiation free before the second scintigraphy is performed. All cases should contain complete clinical and laboratory (weight, serum parathyroid hormone (PTH) level, and Ca 2+ level) information together with data from both performed scans, the detailed description of the surgical intervention, and the pathological data. The same radiological protocol should be used in all selected cases. Patients with known recent radiological investigation and/or radiation treatment during the last month before the study were excluded from the study. The SPECT/CT acquisition was performed by hybrid SPECT/CT system, with the Symbia T multislice 64 camera (Siemens, Germany). For SPECT, the acquisition time was 600 s in conventional SPECT/CT and 900 s in low-dose SPECT/CT at 1 h postinjection. The SPECT component of the study was acquired in 128 projections, with 3° angular step, in a 128 × 128 matrix, and at 10–12 s per view and acquisition zoom = 2. Reconstruction was performed iteratively, using the “flash 3D” ordered subset expectation maximization method, with 4 subsets and 8 iterations, filtered with 8.4 Gaussian filter. The low-activity CT parameters were 130 kV, 17 mAs with 2-mm slice thickness (due to an automatic system aiming to control the absorbed dose – “care dose”). The actual tube current was not the same in every patient, ranging from 13 to 20 mAs with 16.6 as a mean ± 0.8 as standard deviation. The SPECT acquisition took approximately 11 min, whereas the CT acquisition took approximately 10 s.
Our mean effective dose with low-activity SPECT/low-activity CT scan (ULDS LDCT scan) was 4.59 mGy, which is 29% of the SPECT/Low-Activity CT with 925 MBq of Tc-99m-sestamibi (SLDCT scan) with mean effective dose of 15.7 mGy. Both scans were compared in terms of the presence/absence of adenoma or hyperplasia of the glands and of the localization of the lesion by two senior nuclear medicine physicians blinded to clinical data. All analyzes were made using the same window, contrast, and brightness. The same equipment and methodological procedures were adopted by both evaluators. Each physician independently read 54 primary scan images (with 925 MBq) and 54 preoperative scan images (with 185 MBq), but the final diagnosis was reached by mutual agreement. The questions to be answered by the image investigation were as follows: (1) the presence of the lesion (yes/no), (2) the location of the lesion (thyroid upper lobe/thyroid lower lobe/intrathyroid/mediastinal), (3) the presence of multiple lesions (yes/no), and (4) the type of the lesion (adenoma/hyperplasia/carcinoma). Imaging interpretations answering for the first three questions were compared to surgical results and the radiologists' opinion about the type of the lesion was compared to final pathological reports. The sensitivity of both investigations in consideration was then calculated. The data were statistically evaluated by three-dimensional analysis of variance, SPSS, Standard version 17.0 (SPSS, Chicago, IL, 2007). The level of significance for all analyses was set at P < 0.05. All 54 selected patients underwent successful parathyroidectomy surgery. Mean preoperative PTH level of the patents was 118 ± 44.8 pg/ml and mean Ca +2 level was 11.3 ± 1.76. The average weight of the patients was 69.6 kg (male average 75.8 kg and female average 61.7 kg). The mean size of the removed adenomas was 16 mm × 11 mm × 7 mm. The pathological findings included 46 single adenomas, two double adenomas (n = 4), two mediastinal adenomas, two intrathyroid adenomas (54 lesions in 52 patients), and two cases of hyperplasia of four glands (eight lesions in two patients). The total number of pathologic findings was 62. Both conventional SPECT/CT (925 MBq) [Figure 1] and low-activity SPECT/CT (185 MBq) [Figure 2] and [Figure 3] investigations identified 47/47 single adenomas, all four double adenomas, both mediastinal adenomas, and all hyperplasia lesions [Figure 4] (61/62; agreement with surgery 98.4%). The agreement in location of the lesion between conventional SPECT/CT and surgery was also 98.4% because one single adenoma was localized in the right lower lobe but appeared to be in the right upper lobe. The agreement in the location of the lesion between low-activity SPECT/CT and surgery was 100%. The agreement with pathological results (adenoma vs. hyperplasia) was 100% for both conventional and low-dose investigations. The conventional and low-activity scans resulted with a false-positive diagnosis in one case of double adenoma. The scans reported a double adenoma, but only a single adenoma was found during surgery. One case of single adenoma was a false-negative diagnosis. The surgery revealed an intrathyroid parathyroid adenoma of 6 mm that was located during the operation with the help of the gamma probe. In this case, the hemythyroidectomy was performed. The sensitivity of both scans for the presence, location, multiplicity, and the type of pathology is presented in [Table 1]. Managing the risks of nuclear medicine imaging procedures depends on two principles of radiation protection: an appropriate justification for performing each procedure, and careful optimization of the radiation dose used during each procedure. A trend toward reducing radiation-exposure dose for both patients and medical staff is the “as low as reasonably achievable” principle recommending that the patients should be exposed to an optimal radiation dose necessary for producing a high-quality image. Since Tc-99m-sestamibi was introduced as a new agent for parathyroid imaging in 1989, the radiation activity of 370–1100 MBq was recommended for a standard procedure., This approach, however, reflected the standard activities used for myocardial imaging. The study of Wei et al. reported that 296 MBq is sufficient to obtain accurate results in parathyroid cases, but this study was overlooked. The 20-year development of radiological diagnostic devices and combination of SPECT, CT, and scintigraphy techniques permits reducing the radiation dose without compromising the results of radiological investigations. In the present study, we found impressively high rates of positive preoperative identification and localization of parathyroid adenomas using a novel technique comprising the administration of a low dose of Tc-99m-sestamibi, followed after a short period of time by a combined SPECT and CT scan, for the identification and localization of a parathyroid adenoma on the day of surgery. The only case of misdiagnosis could be due to the low weight of the adenoma that was <0.1 g, which is below the camera resolution. An additional 60 min since the Tc-99m-sestamibi injection SPECT/CT image permits to differentiate the thyroid and the parathyroid tissues, to detect and locate the parathyroid adenoma, and to assess reverse redistribution and rapid washout of Tc-99m-sestamibi. For these purposes, the 60-min image was found to be more informative than the 120-min image. The reverse redistribution and rapid washout of Tc-99m-sestamibi were researched in patients with acute myocardial infarction., A rapid washout of Tc-99m-sestamibi from a parathyroid adenoma was reported in 1995 and was discussed by Krausz et al. in detail in 2001., These authors indicated that the rapid washout was the main reason of the false-negative results that were obtained. To overcome this problem, Palestro et al. suggested subtraction imaging. We believe that our approach with 15 min – 60 min – 120 min images may be helpful in both the thyroid uptake pattern which requires delayed scan and in early washout cases. As we wanted to show in our study, such approach provides accurate results even if only 185 MBq of Tc-99m-sestamibi was injected. Despite the low radioactivity, no significant discrepancies were found between the diagnoses of both scans regarding localization of parathyroid adenoma. The 185 MBq scans were absolutely adequate for recognition of the parathyroid lesions including the intrathyroid location of the gland. We, therefore, confirm the recently published report on the subject. While the Nuclear Medicine Procedure Manual 2012–14 and other above-mentioned similar manuals specifically indicate 925 MBq radioactivity, there were several recent attempts to use 740 MBq,, 600–740 MBq, and 555 MBq  in parathyroid cases. The authors reported correctly localized abnormal parathyroid glands in 75% of the cases  and the sensitivity of 69.2%. Our results with 925 MBq were more impressive, and we believe that such radioactivity is optimal if possible intrathyroid or mediastinal location of the parathyroid glands is to be taken into account. Specifically for gamma probe guidance, radioactivity of 37 MBq (10 min before surgery) replacing radioactivity of 555 MBq (2 h before surgery) was also tried with reportedly good results. While we agree with the authors that 555 MBq for gamma probe guidance is probably too much, we are not sure that 37 MBq can be equally successful in cases of intrathyroid parathyroid glands. While assessing radiation effective doses were not the aim of this study, some general considerations are to be expressed. Activities and radiation effective doses are interconnected. The accepted effective radiation dose for adults from Tc-99m-MIBI is 0.009 mSv/MBq., The usual protocol for dual-phase parathyroid imaging is done with 925 MBq of Tc-99m-MIBI producing effective radiation dose of 8.325 mSv. When the low dose of Tc-99m-MIBI dual-phase parathyroid imaging with 185 MBq is performed, the effective radiation dose coming from MIBI only is 1.665 mSv. In fact, these doses are even lower because the received activity is always lower than the administered activity. Administering 185 MBq instead of 740 or 925 MBq minimizes the radiation-exposure dose to the surgeon and operating theater personnel. The current research has several limitations. All our patients underwent surgical resection and those patients with hyperparathyroidism who were not operated were not assessed. We did not have cases with microadenomas in our series and cannot speculate on radiological investigations for these cases. While we were able to assess false-negative, false-positive, and true-positive results of the diagnostic procedure, we were unable to assess true-negative results (specificity) because patients with them were not operated and did not undergo the second radiological low-dose investigation. Our data suggest that the radioactivity of 185 MBq applied in the evaluation of the parathyroid glands provides results similar to the currently used 925–1110 MBq if used for diagnostic dual-phase parathyroid scintigraphy with Tc-99m-sestamibi. Such radioactivity may reduce the exposure to radiation of the patients and the staff without compromising results of the investigation. Akerström G, Malmaeus J, Bergström R. Surgical anatomy of human parathyroid glands. Surgery 1984;95:14-21. Livolsi VA. Parathyroids: Morphology and pathology. In: Bilezikian JP, editor. The Parathyroids: Basic and Clinical Concepts. San Diego, New York: Academic Press; 2001. p. 1-10. Wells SA Jr., Doherty GM. The surgical management of hyperparathyroidism. In: Bilezikian JP, editor. The Parathyroids: Basic and Clinical Concepts. San Diego, New York: Academic Press; 2001. p. 487-98. Krakauer M, Wieslander B, Myschetzky PS, Lundstrøm A, Bacher T, Sørensen CH, et al. Aprospective comparative study of parathyroid dual-phase scintigraphy, dual-isotope subtraction scintigraphy, 4D-CT, and ultrasonography in primary hyperparathyroidism. Clin Nucl Med 2016;41:93-100. Yuan LL, Kan Y, Ma DQ, Yang JG. Combined application of ultrasound and SPECT/CT has incremental value in detecting parathyroid tissue in SHPT patients. Diagn Interv Imaging 2016;97:219-25. Greenspan BS, Dillehay G, Intenzo C, Lavely WC, O'Doherty M, Palestro CJ, et al. SNM practice guideline for parathyroid scintigraphy 4.0. J Nucl Med Technol 2012;40:111-8. Klingensmith III WC, Eshima D, Goddard J. Nuclear Medicine Procedure Manual 2012-14. Englewood, CO: Wick Publishing; 2012. García-Talavera P, Díaz-Soto G, Montes AA, Villanueva JG, Cobo A, Gamazo C, et al. Contribution of early SPECT/CT to 99mTc-MIBI double phase scintigraphy in primary hyperparathyroidism: Diagnostic value and correlation between uptake and biological parameters. Rev Esp Med Nucl Imagen Mol 2016;35:351-7. Haghighatafshar M, Farhoudi F. Is brown adipose tissue visualization reliable on 99mTc-methoxyisobutylisonitrile diagnostic SPECT scintigraphy? Medicine (Baltimore) 2016;95:e2498. Mahajan A, Starker LF, Ghita M, Udelsman R, Brink JA, Carling T, et al. Parathyroid four-dimensional computed tomography: Evaluation of radiation dose exposure during preoperative localization of parathyroid tumors in primary hyperparathyroidism. World J Surg 2012;36:1335-9. Bar R, Przewloka K, Karry R, Frenkel A, Golz A, Keidar Z, et al. Half-time SPECT acquisition with resolution recovery for Tc-MIBI SPECT imaging in the assessment of hyperparathyroidism. Mol Imaging Biol 2012;14:647-51. Lavely WC, Goetze S, Friedman KP, Leal JP, Zhang Z, Garret-Mayer E, et al. Comparison of SPECT/CT, SPECT, and planar imaging with single- and dual-phase (99m) Tc-sestamibi parathyroid scintigraphy. J Nucl Med 2007;48:1084-9. Kim YI, Jung YH, Hwang KT, Lee HY. Efficacy of 99 mTc-sestamibi SPECT/CT for minimally invasive parathyroidectomy: Comparative study with 99 mTc-sestamibi scintigraphy, SPECT, US and CT. Ann Nucl Med 2012;26:804-10. Thompson GB, Mullan BP, Grant CS, Gorman CA, van Heerden JA, O'Connor MK, et al. 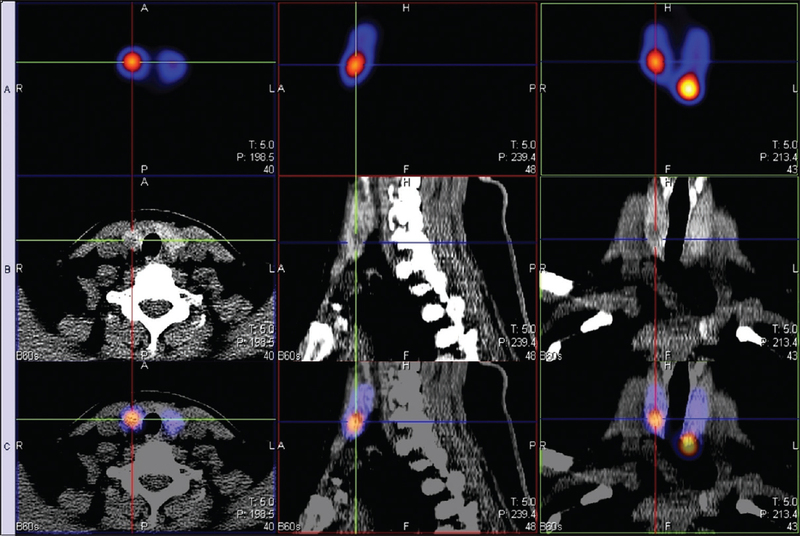 Parathyroid imaging with technetium-99m-sestamibi: An initial institutional experience. Surgery 1994;116:966-72. Coakley AJ, Kettle AG, Wells CP, O'Doherty MJ, Collins RE. 99Tcm sestamibi – A new agent for parathyroid imaging. Nucl Med Commun 1989;10:791-4. Morita ET, Kwan WP, Clark OH. Technetium Tc 99m sestamibi for parathyroid imaging. West J Med 1994;161:413. Wei JP, Burke GJ, Mansberger AR Jr. Preoperative imaging of abnormal parathyroid glands in patients with hyperparathyroid disease using combination Tc-99m-pertechnetate and Tc-99m-sestamibi radionuclide scans. Ann Surg 1994;219:568-72. Ono S, Takeishi Y, Yamaguchi H, Abe S, Tachibana H, Sato T, et al. Enhanced regional washout of technetium-99m-sestamibi in patients with coronary spastic angina. Ann Nucl Med 2003;17:393-8. Du B, Li N, Li X, Li Y, Hsu B. Myocardial washout rate of resting 99 mTc-sestamibi (MIBI) uptake to differentiate between normal perfusion and severe three-vessel coronary artery disease documented with invasive coronary angiography. Ann Nucl Med 2014;28:285-92. Staudenherz A, Kletter K, Leitha TH. Rapid washout of technetium-99m-MIBI from a large parathyroid adenoma. J Nucl Med 1995;36:1928-9. Krausz Y, Shiloni E, Bocher M, Agranovicz S, Manos B, Chisin R, et al. Diagnostic dilemmas in parathyroid scintigraphy. Clin Nucl Med 2001;26:997-1001. Palestro CJ, Tomas MB, Tronco GG. 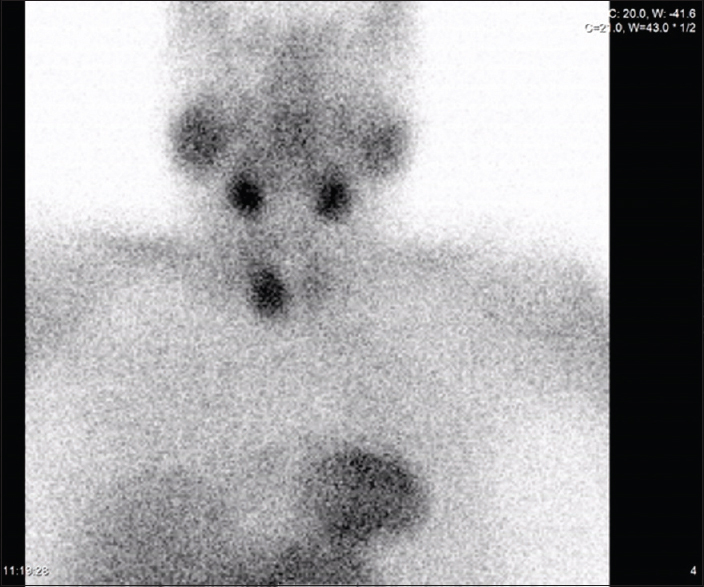 Radionuclide imaging of the parathyroid glands. Semin Nucl Med 2005;35:266-76. Jangjoo A, Sadeghi R, Mousavi Z, Mohebbi M, Khaje M, Asadi M, et al. Minimally invasive radioguided parathyroid surgery using low-dose Tc-99m-MIBI – Comparison with standard high dose. Endokrynol Pol 2017;68:398-401. Gedik GK, Sari O. Influence of single photon emission computed tomography (SPECT) reconstruction algorithm on diagnostic accuracy of parathyroid scintigraphy: Comparison of iterative reconstruction with filtered backprojection. Indian J Med Res 2017;145:479-87. Li P, Liu Q, Tang D, Zhu Y, Xu L, Sun X, et al. Lesion based diagnostic performance of dual phase 99mTc-MIBI SPECT/CT imaging and ultrasonography in patients with secondary hyperparathyroidism. BMC Med Imaging 2017;17:60. Ikuno M, Yamada T, Shinjo Y, Morimoto T, Kumano R, Yagihashi K, et al. Selective venous sampling supports localization of adenoma in primary hyperparathyroidism. Acta Radiol Open 2018;7:2058460118760361. Gencoglu EA, Aktas A. The efficacy of low and high dose (99m) Tc-MIBI protocols for intraoperative identification of hyperplastic parathyroid glands in secondary hyperparathyroidism. Rev Esp Med Nucl Imagen Mol 2014;33:210-4. Moosvi SR, Smith S, Hathorn J, Groot-Wassink T. Evaluation of the radiation dose exposure and associated cancer risks in patients having preoperative parathyroid localization. Ann R Coll Surg Engl 2017;99:363-8.